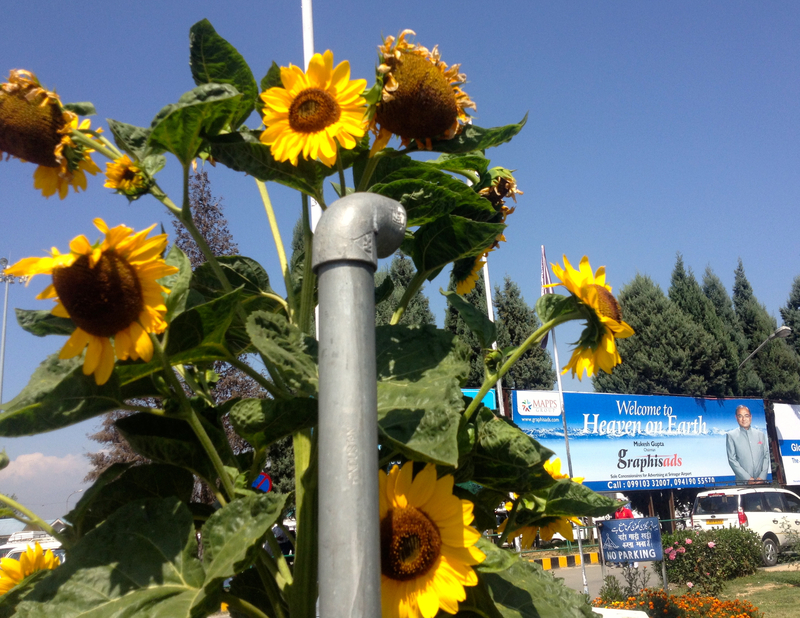 The 2013 Jashn- e- Aman Festival began in Kashmir, India on September 21st the International day of Peace. I flew out from New Delhi that morning and reached Srinagar airport where I met Dhruv Sangari and his three member band. The band would be serenading all of us at the opening night that evening. 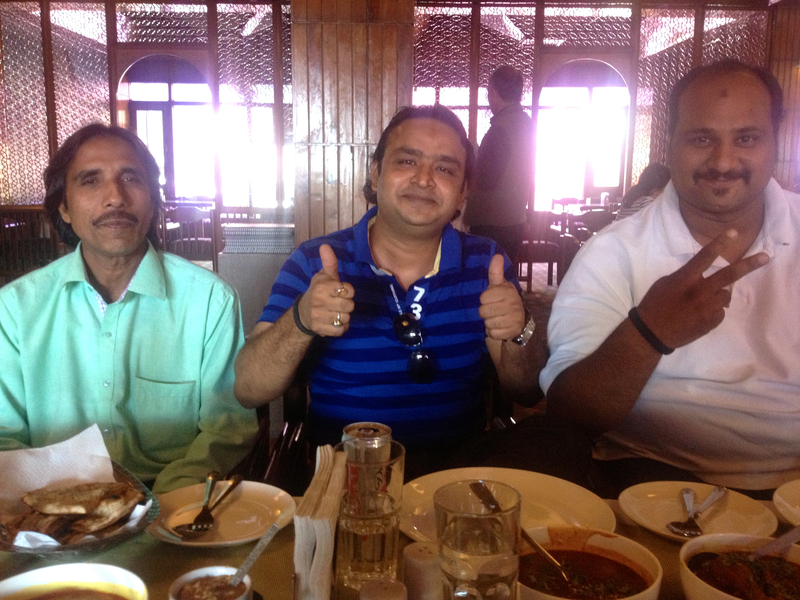 I got to know the band well over a lunch which featured some of the most delectable meat dishes I had ever had. My favorite dish was the spinach sautéed in mustard oil. Simple, yet unforgettable. Having a delicious meal makes an unfamiliar place always a little comforting for me. If the state of Kerala in South India is popularly termed God’s own country, Kashmir is popularly called ‘Heaven on Earth.’ The term apparently originates from a Mughal emperor centuries ago, who said ‘If there is heaven on Earth it is here, it is here, it is here.’ But this heaven has obviously been afflicted by the evil eye (nazar in urdu and Turkish) a superstitious belief common to many middle Eastern and Persian cultures. Kashmir is one of the biggest conflict areas in South Asia and one of the most highly militarized zones. The history and skirmish between India and Pakistan for this slice of heaven is long, layered and complicated. And the effects of this struggle could be witnessed as we drove past broken down buildings, roads that had not been fixed and armed personnel at every street corner. The sights of guns soon vanished from my mind as we parked our car at Nigeen Lake. 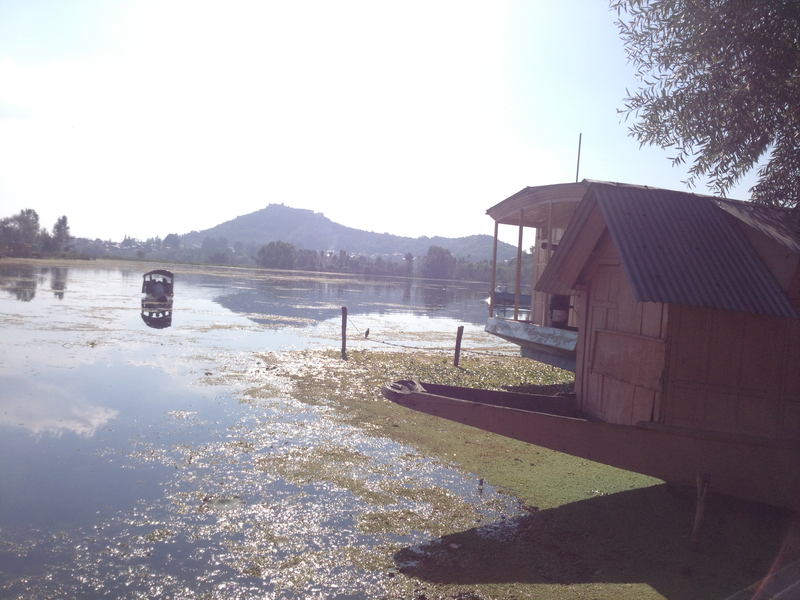 This lake is a part of the famous Dal lake featured in umpteen Bollywood films and is less touristy and absolutely breathtaking. 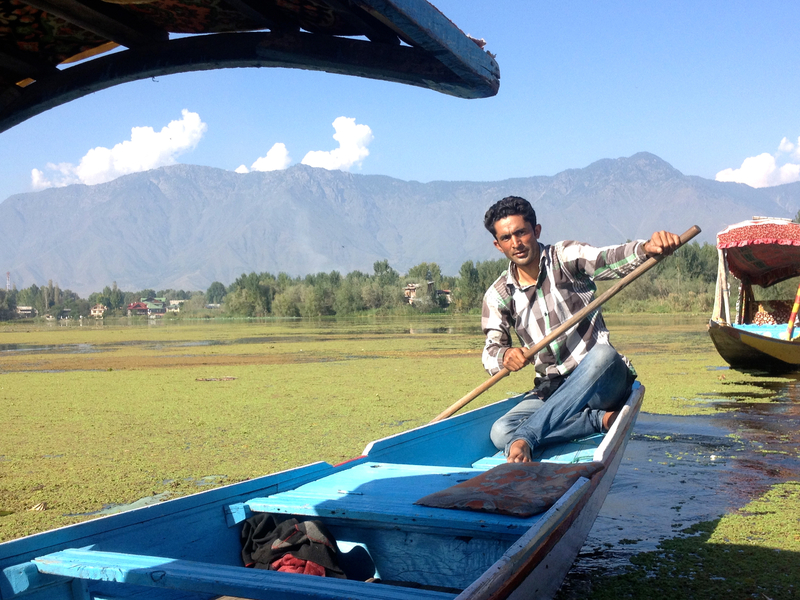 We stepped as daintily as we could on to the shikaras, Kashmiri ships which look fragile but are sturdy and glide effortlessly through the water lilies and foliage growing in the lakes. 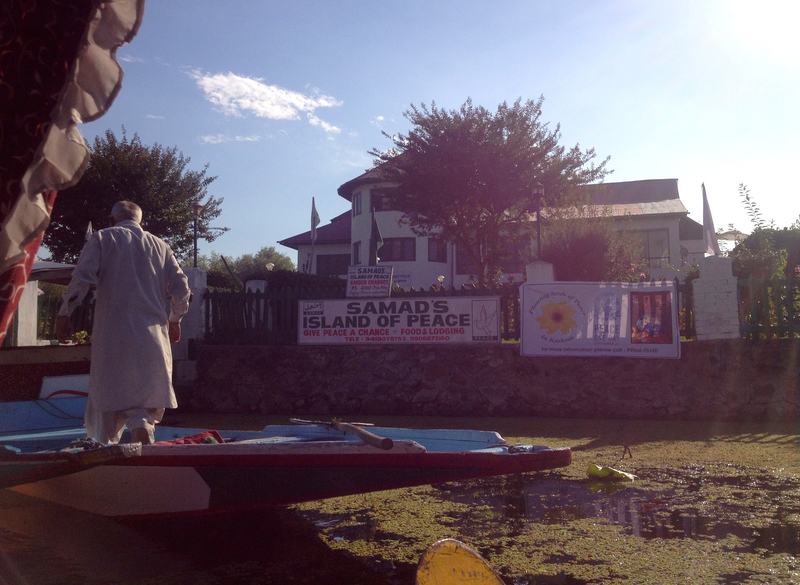 We reached Samad's Island of Peace Hotel. A unique privately owned historical building where Dhruv Sangari, Siraj Khan, Salaamat and Pavan played serene sufi music under the stars that night to open the 2013 Jashn-e-Aman Festival. So the festival started on a high melodious note. 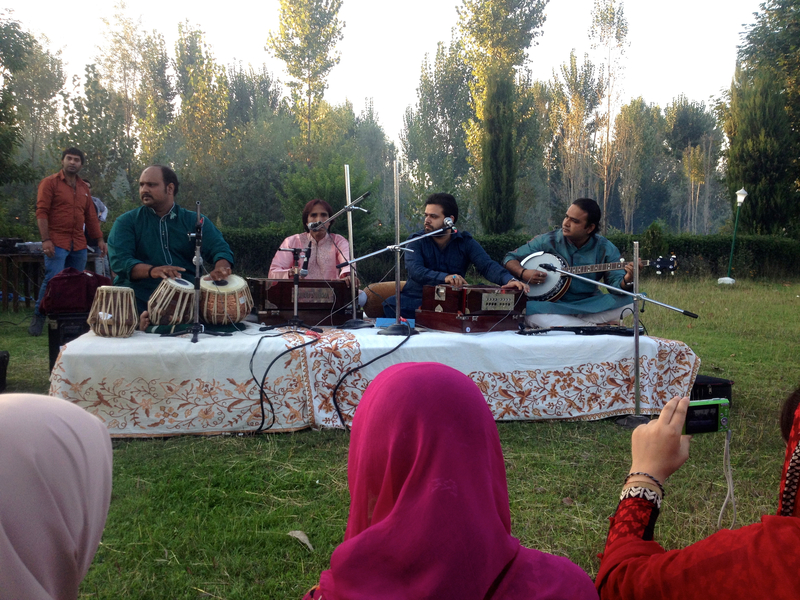 To give you perspective just a week ago the famous conductor Zubin Mehta held a concert in Srinagar’s Mughal era Shalimar gardens to an audience packed with the Nation’s glitterati. The concert was rocked with protests by the separationists and led to a statewide shutdown. In light of these happenings and shootings in the district of Shopian my family had been hesitant about letting me go to Kashmir. But I managed to convince them of my safety and everything was off to a good start and I joined the entourage of STEP’s facilitators and we took off for Pulwama, a district to the North, where the screenings were to be held. The screenings of The Taxi Takes on the World were held on the 23rd of September at the Kashmir Creative Educational Foundation. In spite of the problems in the region many students braved it to come attend. Yes, many of the things that can be taken for granted by many of us were things that Kashmiris were used to either waiting for or fighting for. I screened my own taxi takes from New York and Mumbai first and then introduced the entries for the film festival. One observation I had was that during the screening of the short film ‘Women and Islam’ there is a section where a conservative Muslim man tries to justify the Taliban’s acts. He says that a married woman has no right to adultery and that is why she is whipped as punishment. Strangely enough the audience both girls and boys clapped in affirmation. This reaction surprised me. Never before had I had an audience which was 99% Muslim and also never before had I found agreement to the old Muslim man’s perspective from the audience. Or, never agreement expressed openly. Deep down inside it’s not as simple as I make it sound. And to be honest I was an outsider in Kashmir and knew that I did not know enough about the moral compass of the place, or only knew things based on what mainstream media wished to portray. And it reminded me about the core of what this project is all about after all. Cultural understanding doesn’t happen if I only find people who agree with me. I had always encountered resistance to what the Muslim man said while I need to acknowledge that he is not a lone wolf who feels that way. There are many out there with differing views from ours and its only by embracing these other viewpoints that we can try and reach tolerance maybe. Overall there were 6 films screened from New York City, Afghanistan, Iran, Egypt, Pune and Mumbai, India. We did a show of hands for which country they would like to see and they were all excited to view and metaphorically visit the short from Kabul, Afghanistan by Seyyed Ali Mousavi Azad. They connected with it the most and felt Afghanistan and its people were just like them in Kashmir. When the chance came for a Q and A everyone was rather quiet. But soon after when I was alone many students came up to me and wanted to talk to me about their experiences of watching the Taxi Takes. The next day it was time to leave already. I was very lucky to have spent time with Kashmiri youth and be welcomed into their world. I got to know several of the girls very well and we even took some taxi rides together to the local market. At one point while waiting for a taxi I was standing with women wearing different forms of Kashmiri dresses which was fun. I left Kashmir a more informed person for sure. And with a deeper respect for the courage and beauty of it's people.